Walt Tape sent a note about this display that was photographed by Jim Grossman on 24. January 2006 at Tamarak ski resort in Idaho, USA. Among other more common halos, it shows also Wegener arcs (arrows). Diamond dust halo displays near the ski resorts are usually generated by snow making. That seems to be also the case now: "There was limited snowmaking occurring at and below the inversion level, but about 1/2 to a mile away from and in the opposite direction from the display", tells Grossman. 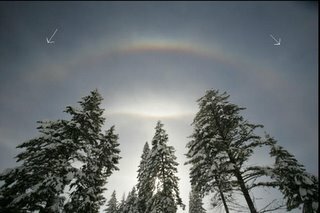 These man made halo displays often get better as ice crystal cloud travels further away from the source. Probably this is due to crystals growing larger as they gather water vapor from the surrounding air. That almost looks South Poleish. That's so amazing! So you can see it on the best ski resorts?